Cats and Dogs Birthday PAW-ty! 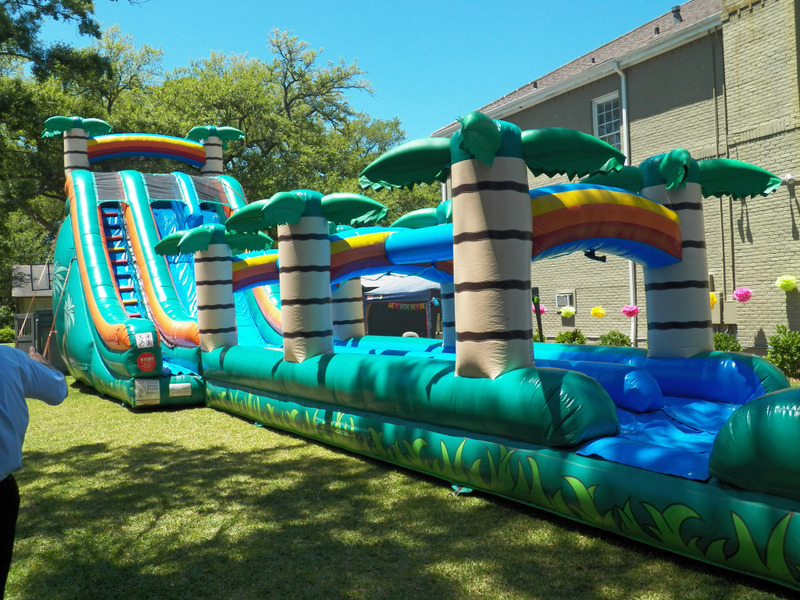 This entry was posted on May 13, 2014 by thatpartychick. 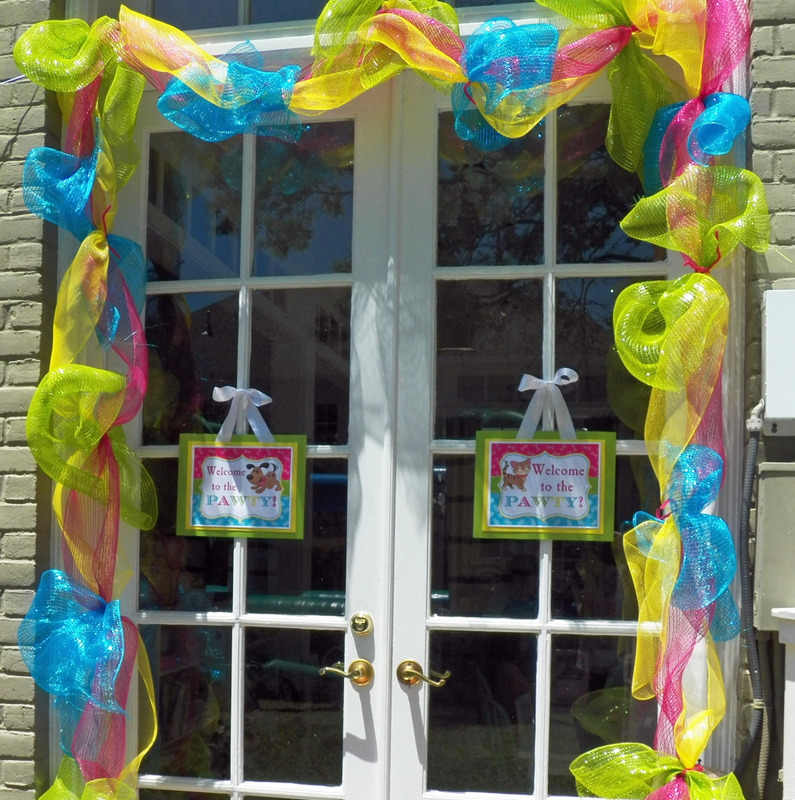 It was a PURR-fect birthday celebration for four young ladies on a beautiful day in May. 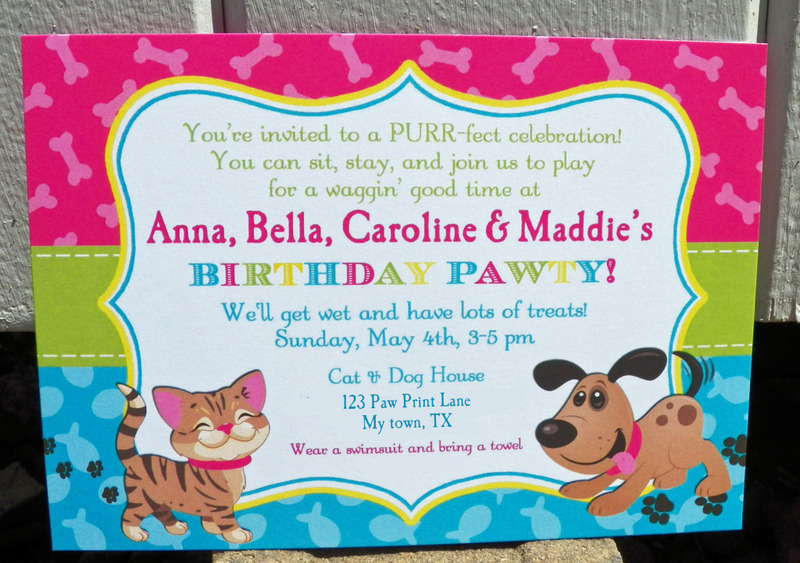 Friends of the birthday girls were invited to sit, stay, and join in the play for this cat and dog themed “Pawty.” The invitation was perfect for the occasion. 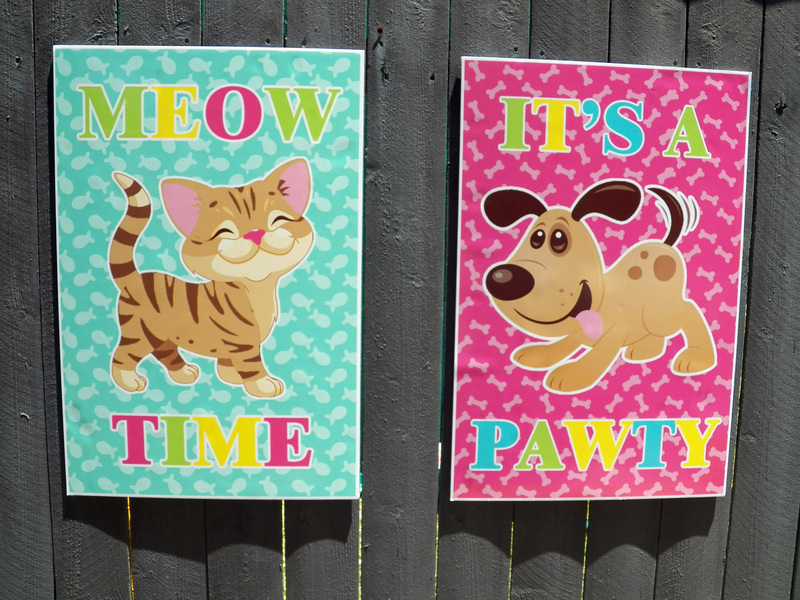 “Meow Time” and “It’s A Pawty” posters greeted arriving guests. The pink dog bone background for the puppy and the blue fish background for the kitten were recurring design elements in the delightful party printables. 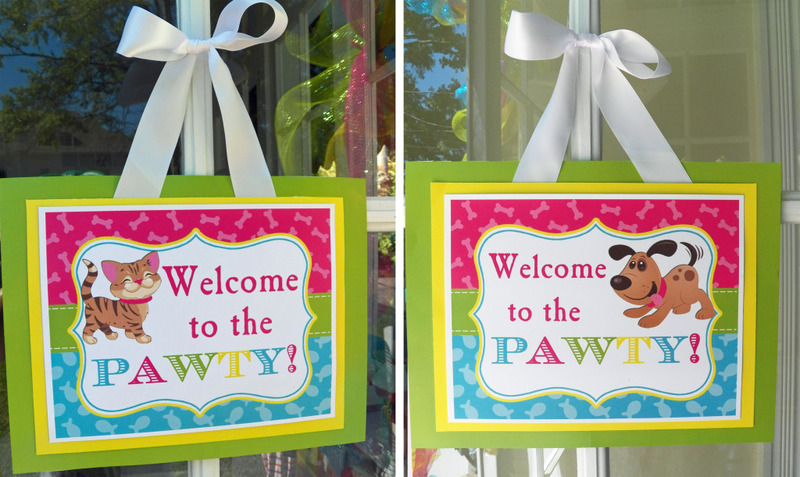 Yellow, pink, blue, and green balloons, party lanterns, and paper flowers created a great party atmosphere!“Welcome to the Pawty” signs with adorable cat and dog images hung from the French doors, which were festively draped with colorful decorative mesh. 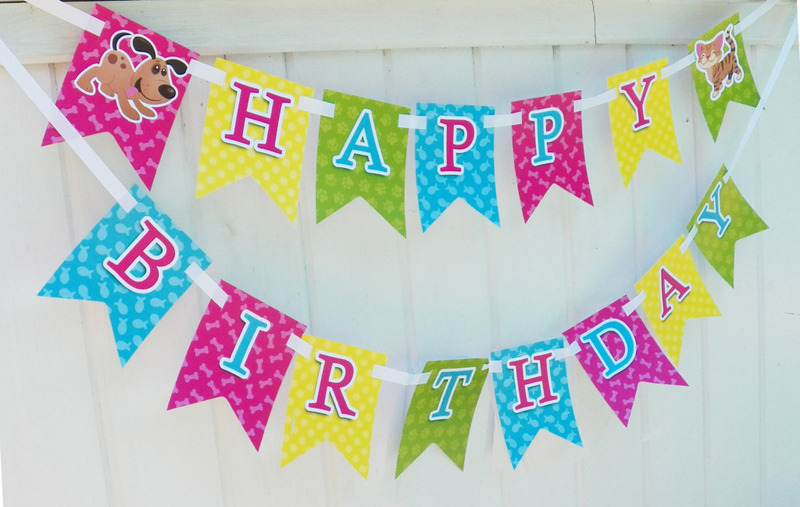 A “Happy Birthday” banner and posters with the name of each birthday girl decorated the area around the swimming pool. 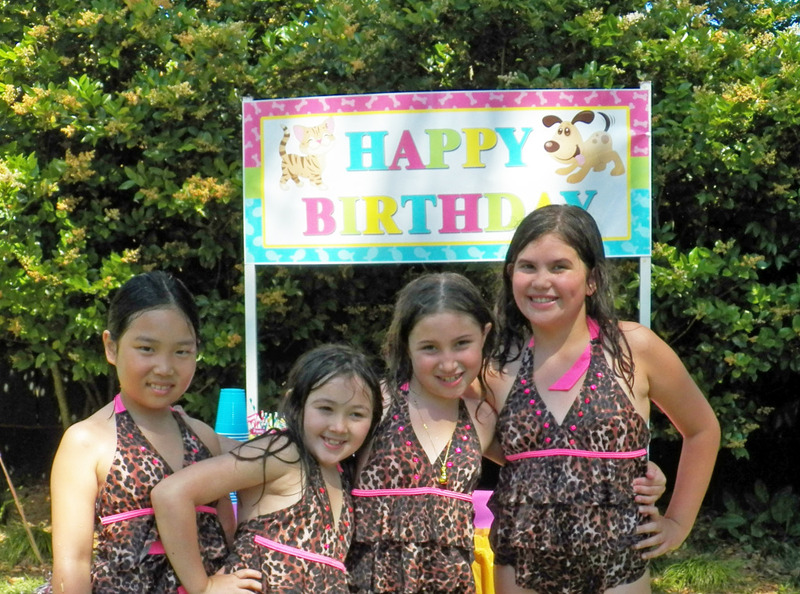 Anna, Bella, Caroline, and Maddie were dressed in matching animal print swimwear and ready to celebrate their birthdays with friends and family! The big banner set the tone for fun. Everyone was excited to enjoy an afternoon of fun in the swimming pool and on the giant inflatable water slide. 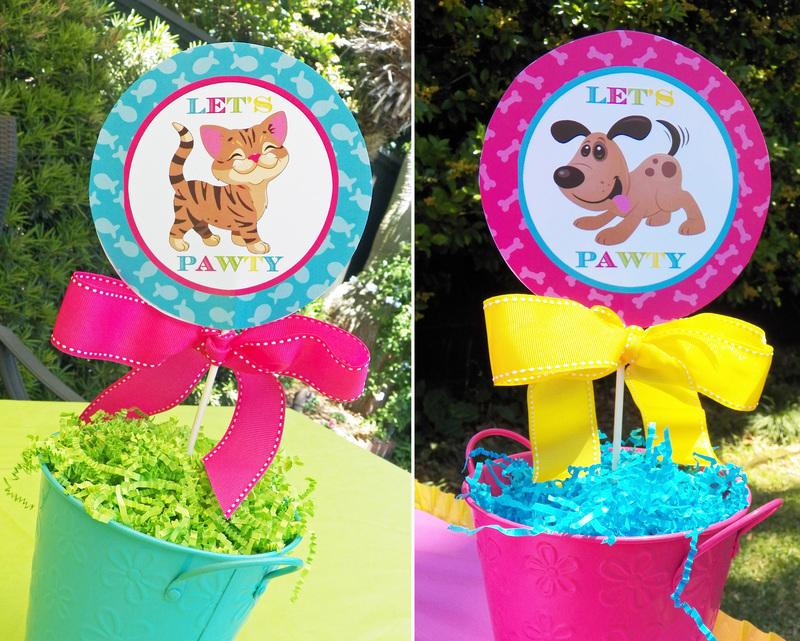 “Let’s Pawty” centerpieces added interest to the party tables located throughout the yard! The pet adoption station was a favorite of the girls. 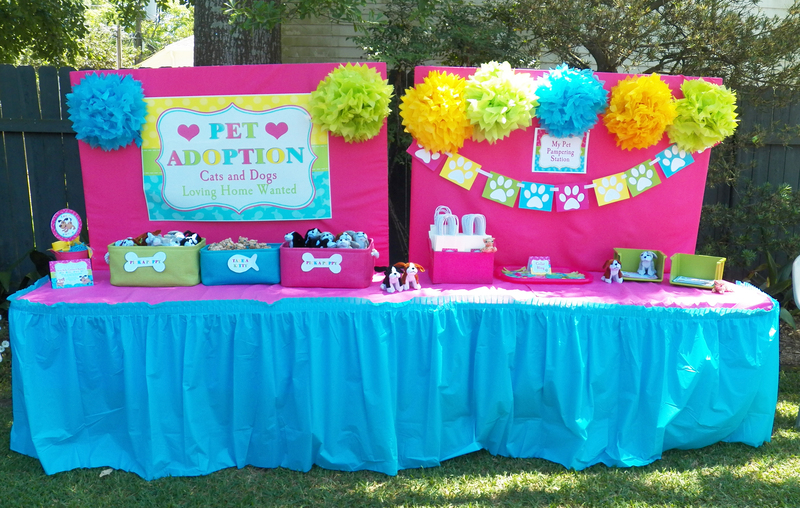 A colorful sign invited guests to adopt a stuffed kitten and puppy to give them a loving home. Black, brown, and gray puppies were available as were tiger striped kittens! 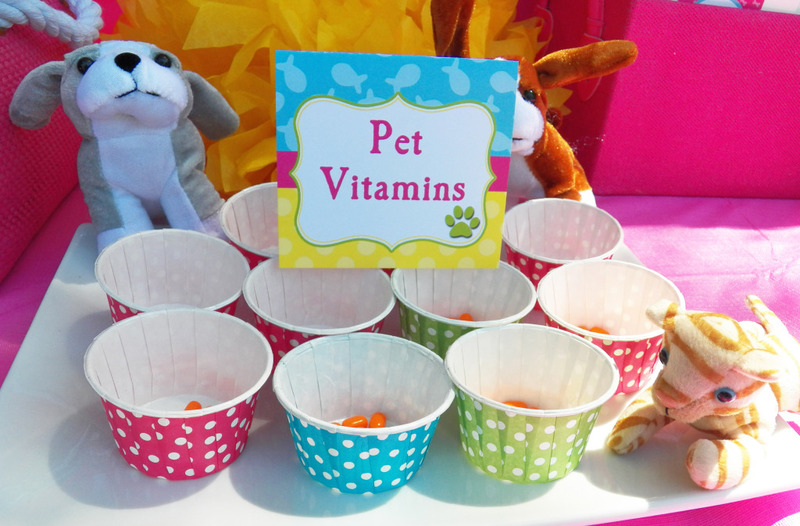 Pets were administered special “vitamins” as part of good animal care. 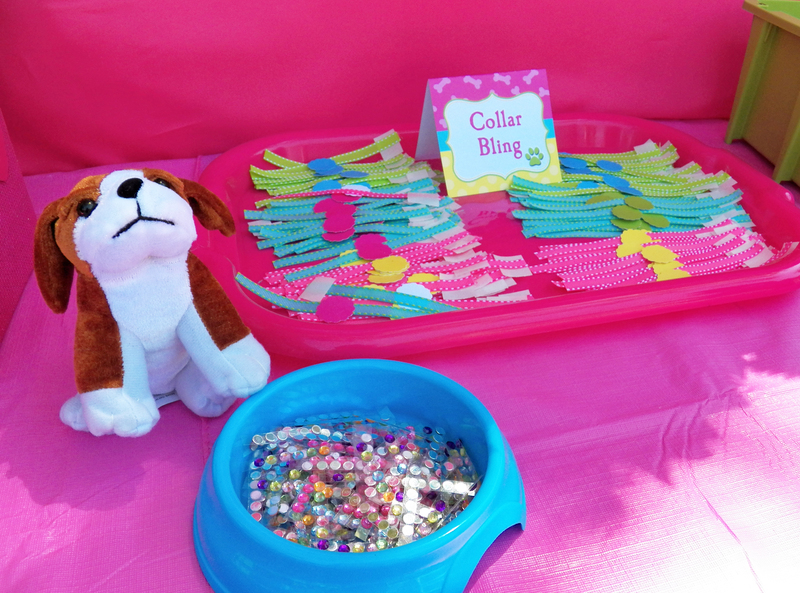 Cats and Dogs received their collars, which their new owners were encouraged to decorate with “bling” at the My Pet Pampering Station! 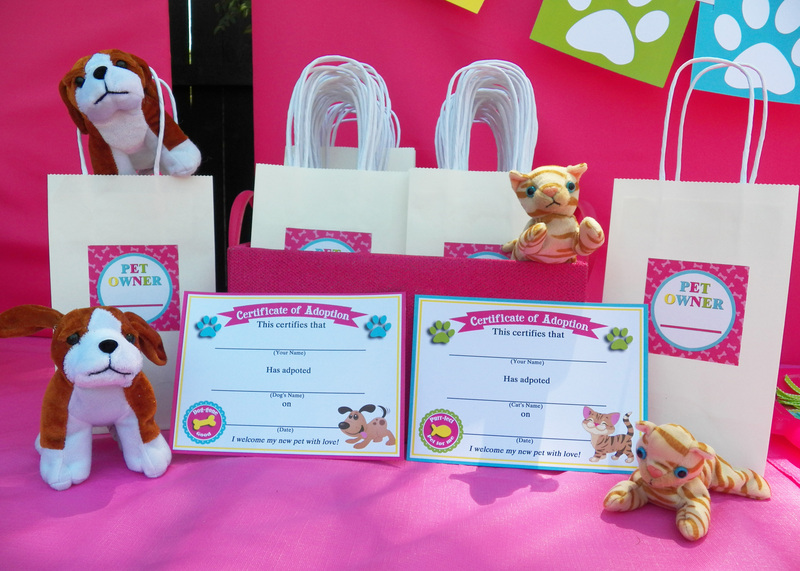 Names were given to the pets and adoption certificates were issued! 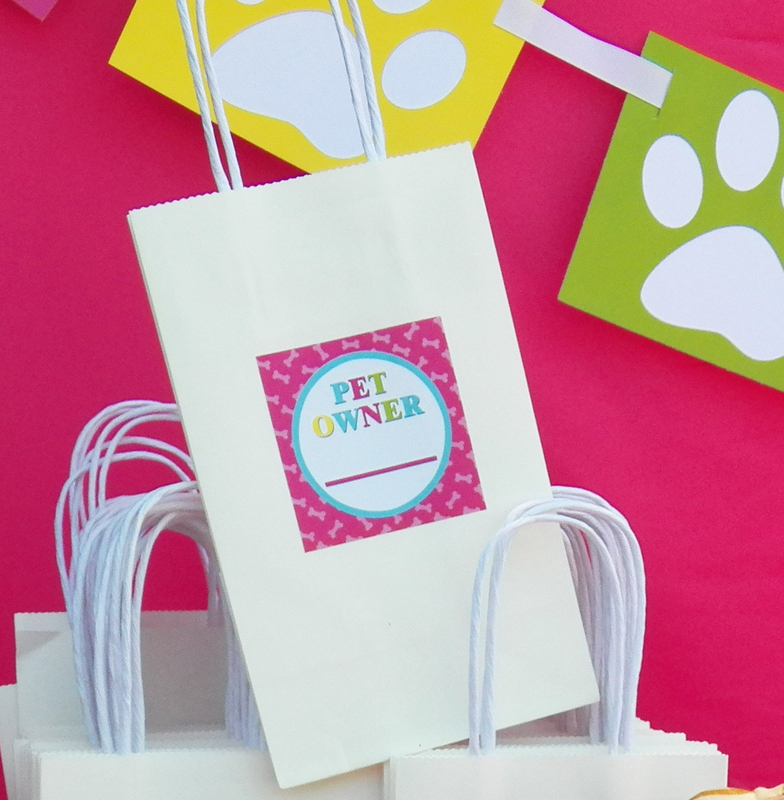 Pet carrier gift bags had a sticker for each child to record their name as the new pet owner. 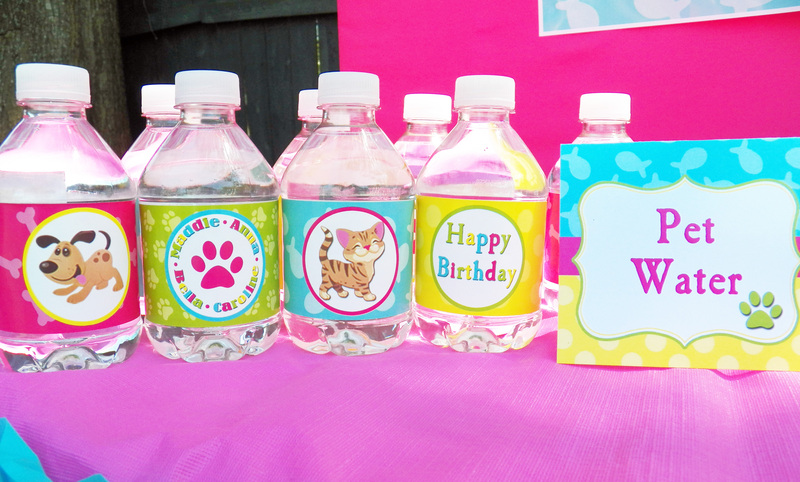 “Pet Water” Bottles were available to all! 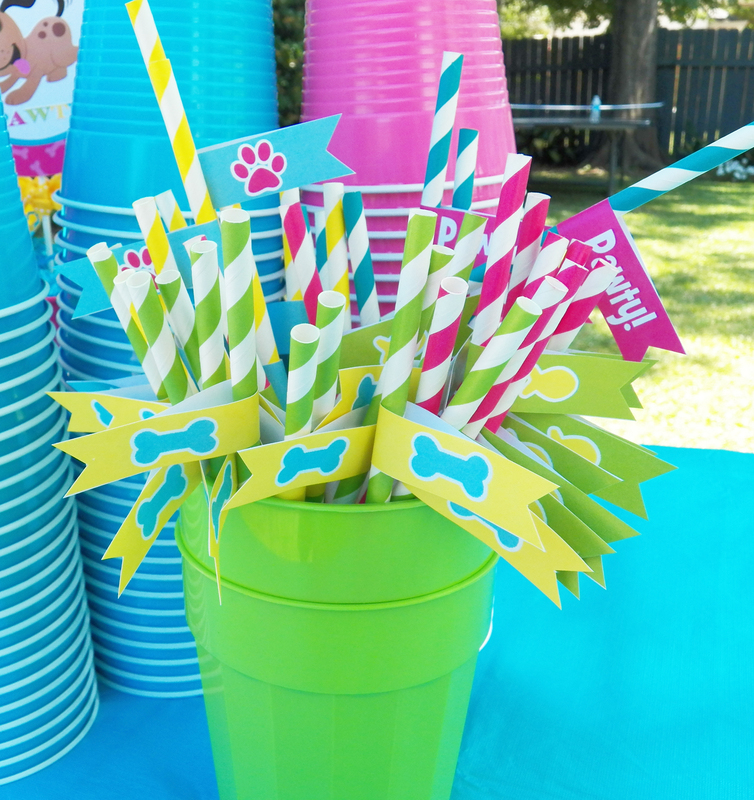 Colorful beverage straws for soft drinks were decorated with cat and dog design straw flags! 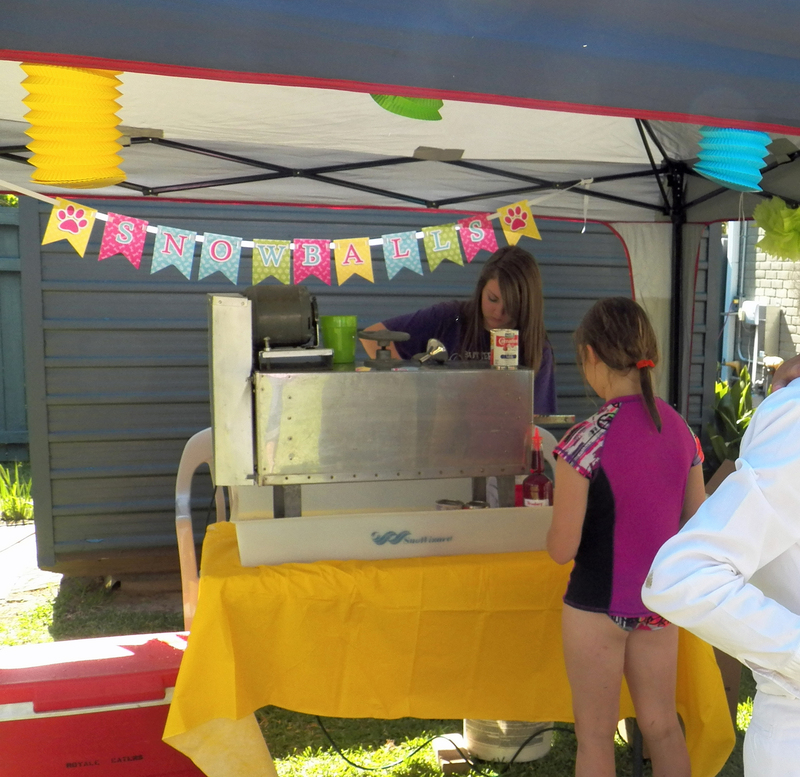 New Orleans snowballs provided cool refreshment and were a crowd pleaser! Birthday girls received personalized flying saucers. The birthday girls each had their own special cupcake topper with their names and bows! 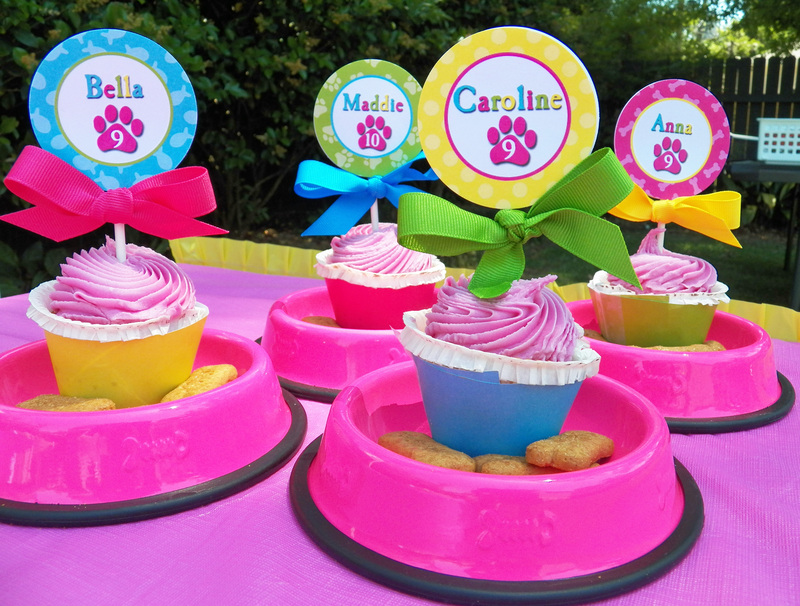 Cupcakes were served in pink dog bowls, which also contained bone shaped cookies! 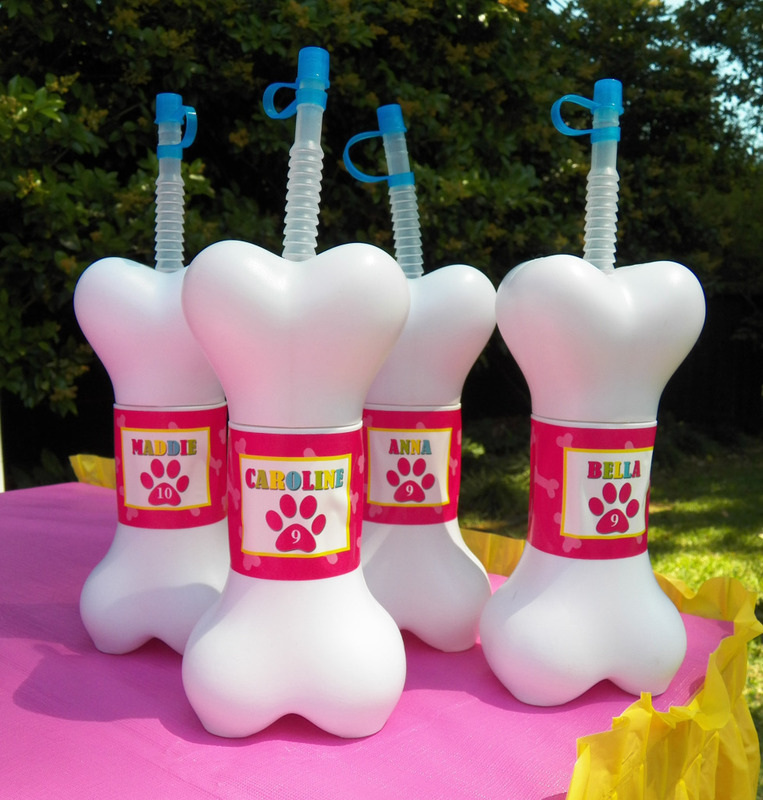 Personalized dog bone shaped beverage sippers were as cute as they were functional! 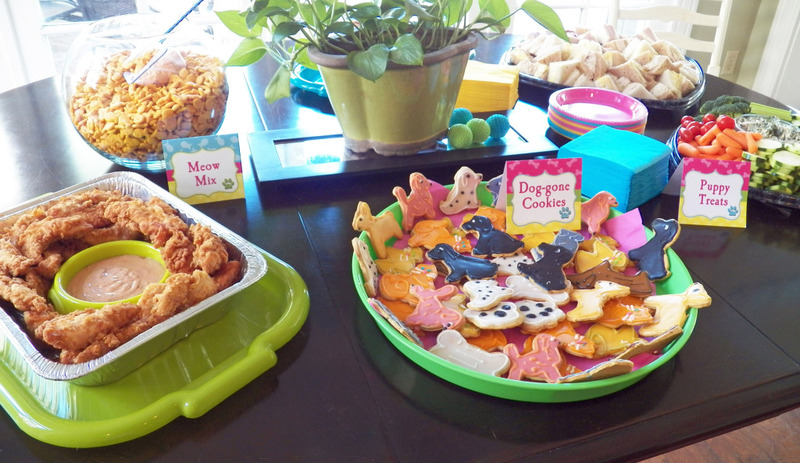 Friends and family feasted on a variety of Puppy Treats including, finger sandwiches, assorted chips, chicken tenders, raw vegetables with dip, watermelon, and fruit snacks. 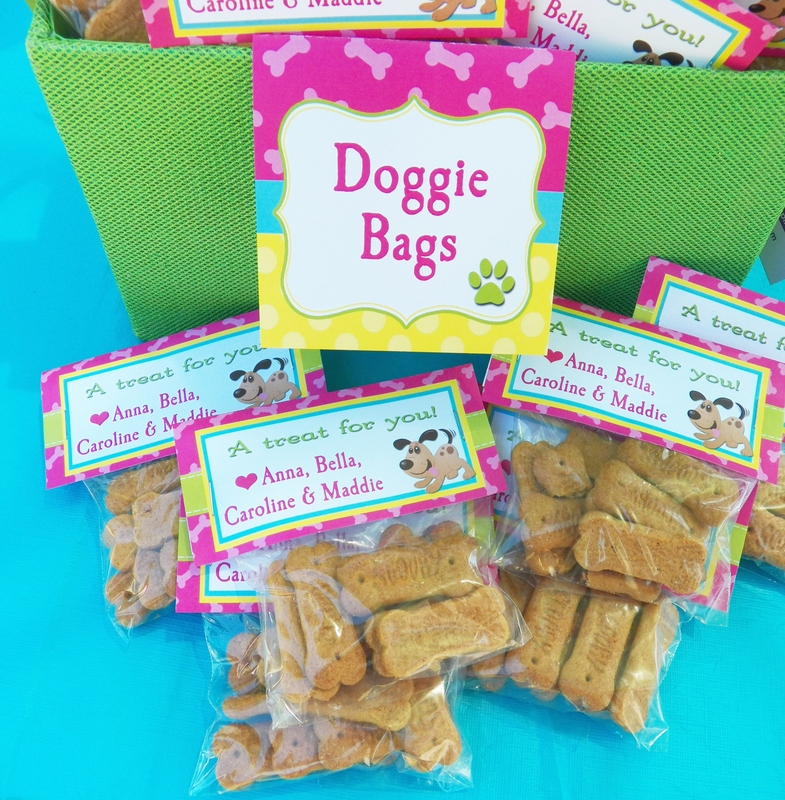 Tent style labels added fun to the food items. 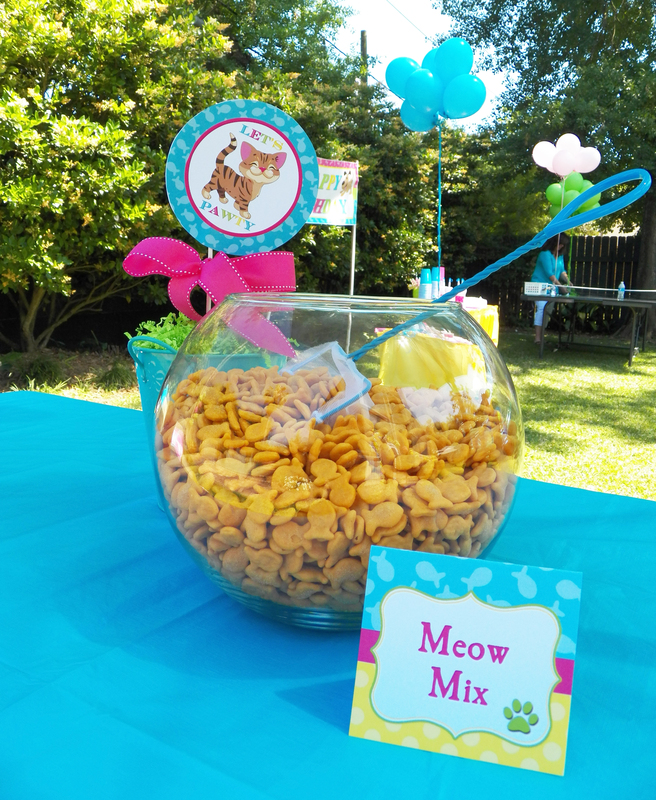 A goldfish bowl with a fish net was a perfect way to serve treats to all the cat lovers in attendance! 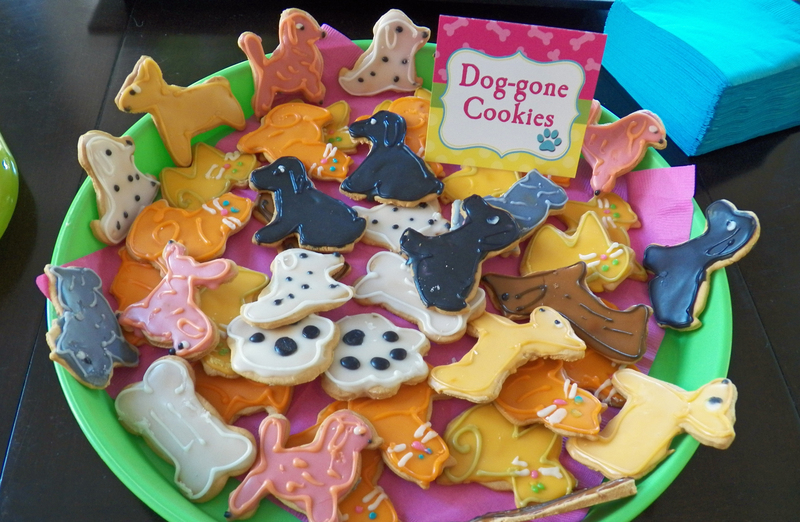 Dog-Gone Cookies featured a variety of different dog and cat options including dog bone and paw cookies. 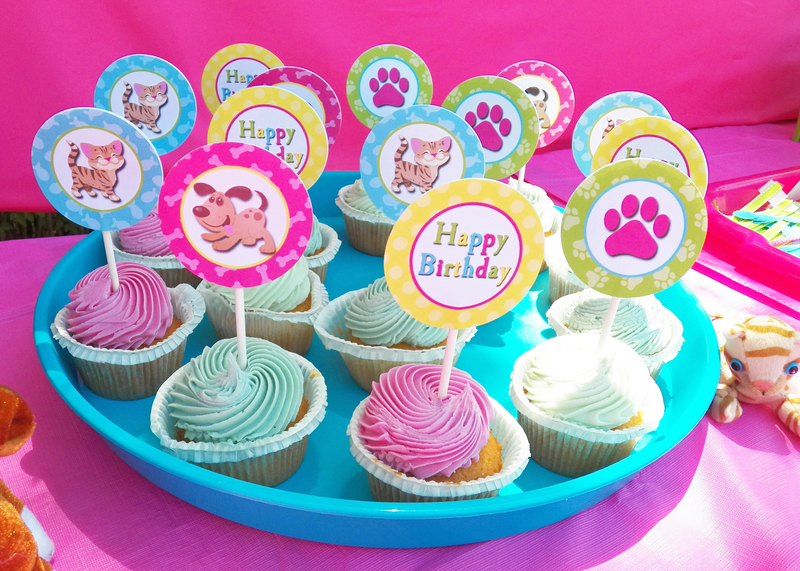 Pup Cakes (Cupcakes) were accented with one of four cupcake topper designs: “Happy Birthday,” Puppy, Kitten, or Paw Print. And no birthday would be complete without ice cream! Meow! Great food, great fun, great friends! 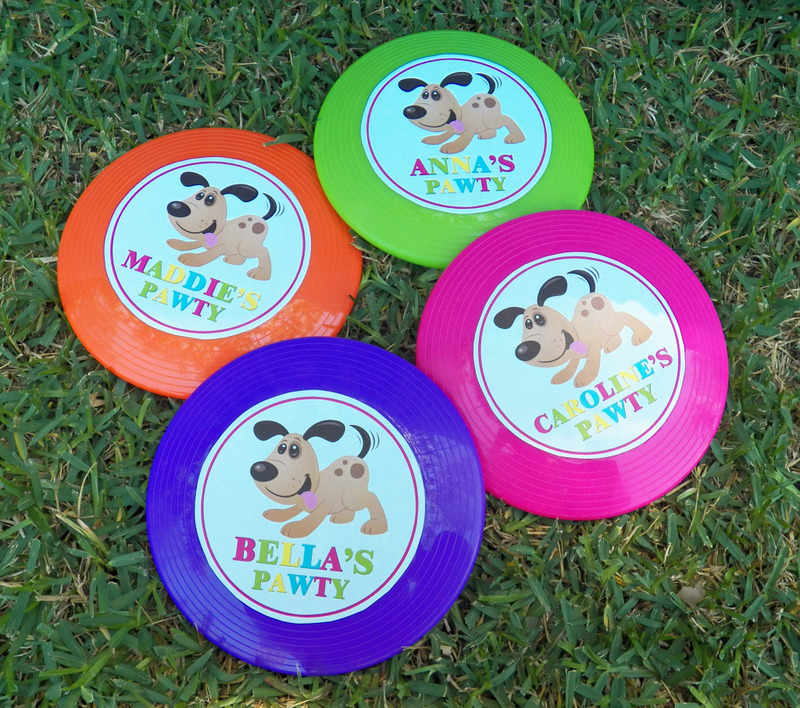 This was a tail-wagging great party! 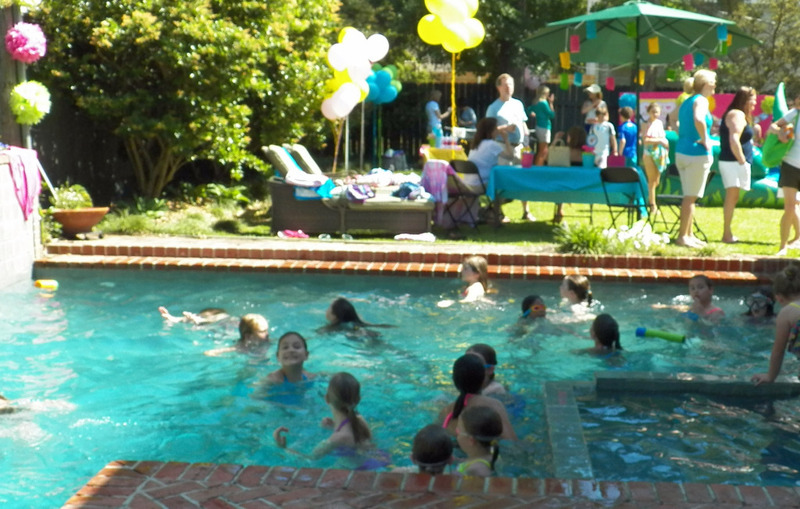 What an adorable party! 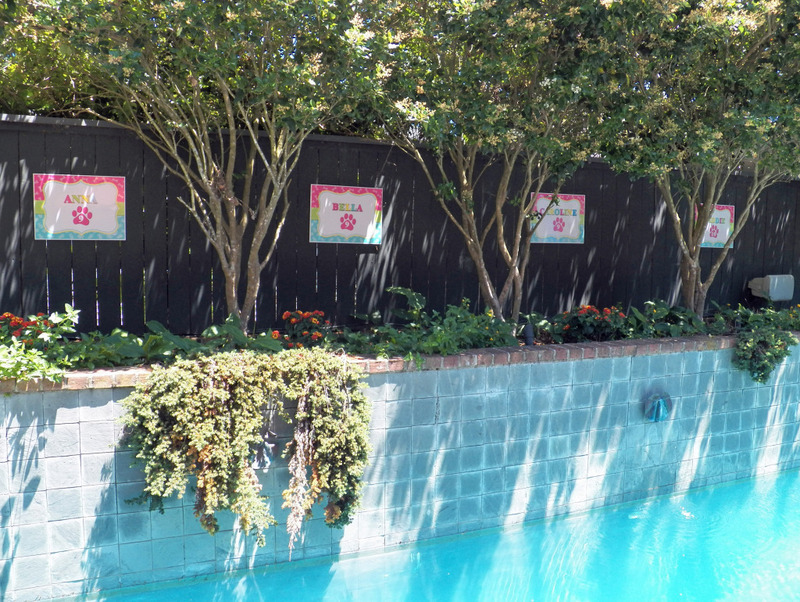 The coordinating signs and banners are the perfect touch. Love all the fun activities and themed snacks!